The punk vest is almost done – just the armholes and weaving in ends (I gotta confess – sometimes I just knot and leave ’em). Problem is, the black ribbing is just killer on my eyes. I love wearing black, but I think anything that I knit with black is going to have to be a mindless, almost-no-shaping garment (ie. bottom-up raglan). The neckband almost killed me. I’ll give the armholes a shot in BRIGHT sunlight this afternoon. Ooooh! 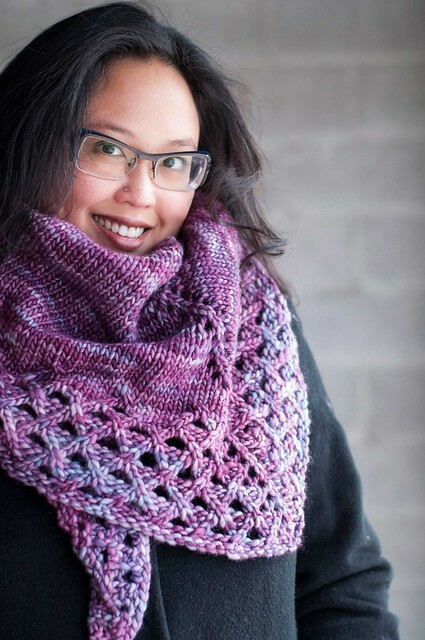 Elann’s Highland Chunky is SO smooshy and soft. I’d buy more but…I really am trying to refrain from that. Plus since it’s a largish gauge (15 sts = 4″) it goes FAST. Here’s half a sleeve of the Urban Aran. 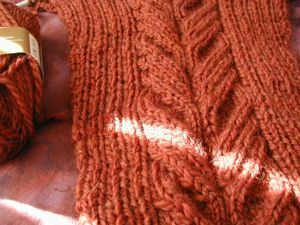 I’m going for an early-spring jacket with this, so there’s no realy hurry, but knowing how long I take with finishing I might as well knit it now. 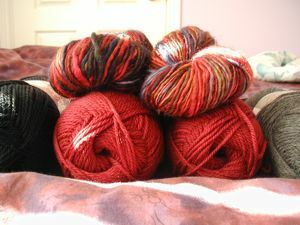 Finally, here’s a pile of yarn from my shelf – two skeins of Manos 106, two of cranberry Patons Classic, plus some more Patons in black and grey. What can I make with some/all (I think probably not the grey) of this? 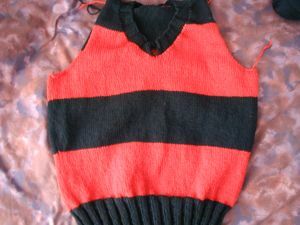 I’m thinking a little fitted top-down cardigan, either with a manos yoke or stripes. Slight problem is that the Manos is a heavier weight than the Patons. I think doubling the Patons would be overkill, so that means that the Manos sections with be tighter/thicker or the Patons sections thinner. Hmmm.